In case we don't already have this elsewhere, this thread is for mentioning articles in magazines or newspapers about vintage Euro-Fords. Its such a rare occurence, we should note when it does. 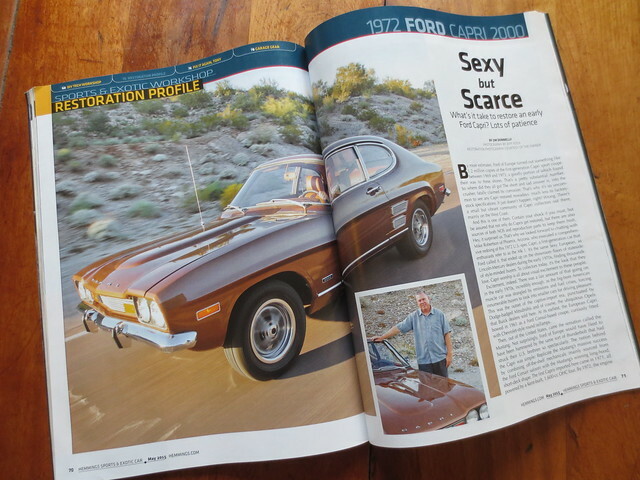 May 2015 Hemmings Sports and Exotic Car has a six page restoration article about a 1972 Capri 2000 owned by Mike Robertson of Phoenix, AZ. The car sounds stunning, even if the article itself have some minor inaccuracies. Jacksonville businessman Ross Bremer is going to take a very fast drive down memory lane this weekend. But he�s hoping to do better than the last time back in 1968. Bremer is one of 150 race car drivers who will compete in the Sportscar Vintage Racing Association�s inaugural Amelia Island Vintage Gran Prix, set for Saturday and Sunday at Fernandina Beach Municipal Airport. The race revives the Gold Crown Prix held there from 1961 to 1974. And he�ll be competing in the same tiny 1967 English Ford Anglia Super he raced there 48 years ago. He remembers towing the Anglia to Fernandina behind a big Pontiac station wagon, but it didn�t last too long on the 2.4-mile runway road course. �They had laid out corners with hay bales and I got in several good practice sessions. Unfortunately the little car broke. We lost a crankshaft pulley,� Bremer said, then mused about this weekend. Association president Tony Parella said two of the airport�s three runways will run cars from 1920s open-wheel racers to 1980s muscle cars. He added Fernandina to its 16-race schedule to give car fans something new to follow the previous weekend�s Amelia Island Concours d�Elegance and the events that sprung up around it. Fans seem fired up by a race that also includes 50 vintage motorcycles, 12 historic aircraft and a classic car show days after the concours. Military airfields used to be popular race venues in the 1950s. Fernandina�s airport also was home to sports car and drag races. But old race cars don�t fade away � they get restored and raced again in vintage events overseen by groups like the 35-year-old Sportscar Vintage Racing Association and its 2,000 members at tracks like Watkins Glen and Sebring. Fernandina Beach resident Ralph Thomas is one of those, an avid racer who campaigns a 1977 Mallock MK 17. He ran into Parella a year ago at Sebring. Remembering that concours founder Bill Warner has lobbied for a race in Northeast Florida for years, he suggested a revival of Fernandina�s. Thomas and Parella secured permission from Fernandina Beach and the Federal Aviation Administration. The racing association signed a five-year agreement with the city and spent close to $500,000 to buy equipment such as 620 barriers, 1,000 tires and 300 hay bales to set it up. Warner will compete this weekend in his ex-Group 44 1971 Triumph TR-6. Bob Tullius, whose Group 44 built Warner�s car, said he will fly down to Fernandina to watch his old steed speed. �I am very proud that he has represented it magnificently, won a lot of races and beat a lot of cars like we used to,� Tullius said. Bremer said he�s looking forward to it, calling it �an absolute blast.� Thomas and his Mallock might be there too. �If everything is under control, maybe,� he said. The race�s spectator entrance is at the Amelia River Golf Club at 4477 Buccaneer Trail. A one-day pass is $25 per person, or a weekend pass is $45. Thursday is a testing day, with practice Friday and racing from 8 a.m. to 6 p.m. Saturday and Sunday. Vintage airplane fly-overs and the Hagerty Show and Shine at Amelia Island car show will be all weekend as well as a Pine Wood Derby Championship. Information and tickets are atsvra.com/events/2016-amelia-island-vintage-gran-prix. Our Son was on the destroyer "The Sullivans". 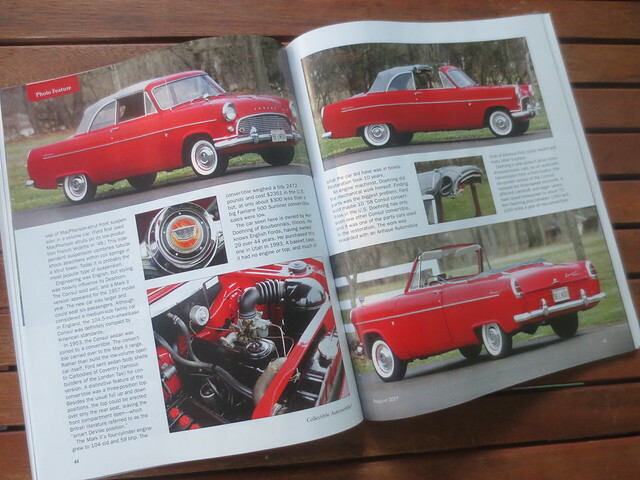 Ken Doehring's Consul is featured in the August 2017 issue of Collectible Automobile.